Officially announced by Pope Alexander VI in April 1498, the jubilee celebrations of 1500 attracted great numbers of pilgrims to the Eternal City and Copernicus and his brother Andreas were among the crowds. Both participated in the high mass, celebrated by the Pope on Easter Sunday and attended by 200,000 (Rome then had a population of only ca 50,000). Delighted by the number, a contemporary Italian chronicler, Sigismondo d`Conti, called that event a ‘concursus Orbis in Urbe’ or the ‘meeting of the world in Rome’. While in Rome, Watzenrode’s nephews were most probably in the care of a Warmian dean, a ‘doctor of decrees’ Bernard Sculteti (d. 1518), who from 1490 worked for the Curia as a notary of the Roman Rota and later become the Pope’s secretary, chaplain and chamberlain. For many years he also legally advised Bishop Watzenrode and even rescued his nephews in 1499 when they had got into debt ‘as students should’. 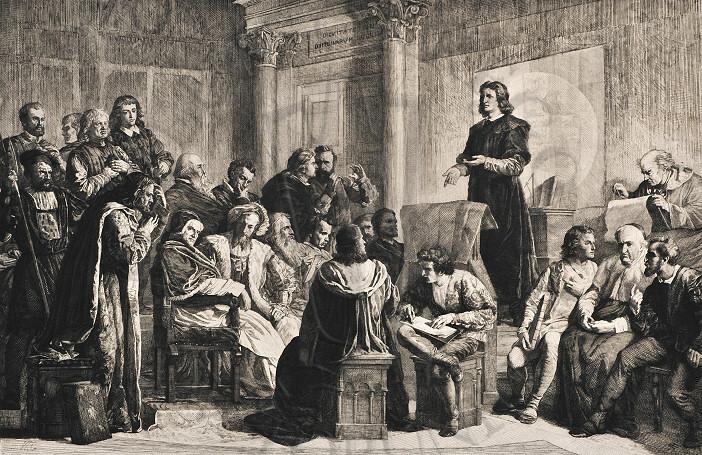 It is quite likely that Sculteti made it possible for Copernicus to do his student’s legal practice in the Papal Curia. Since, accompanied by his friend the Bologna professor Domenico Maria Novara, he conducted astronomical observations in Rome in 1500, Sculteti must have learnt about his fascination with astronomy. It is not inconceivable that Sculteti helped Watzenrode’s nephew give lectures on mathematics, which, as later mentioned by Rheticus, “were attended by many students and outstanding men and masters of this science”. Later in 1512, Sculteti extolled, before the fathers of the Lateran Council, Copernicus’ skills and experience, which they later might have taken advantage of while working on the planned reform of the Julian calendar. During his short stay in Rome Copernicus spent much time in the company of the Polish cartographer Bernard Wapowski and most probably became better acquainted with two professors of Kraków University, Maciej of Miechów (d. 1523) and Stanislaus Biel (d. 1541), who were also staying in Rome on the occasion of the jubilee. He also met compatriots from Prussia who had come to Rome for the indulgences granted at that time (e.g. Fabianus Lusianus) and students who gained their legal experience in the city. They could receive education in the papal palace school (studium curiae) or at the university (studium urbis), institutions which in the late 15th c. ranked among the best European cultural and educational centres offering theological and legal studies. Practice undertaken in the Roman Curia always guaranteed excellent experience needed for future ecclesiastical offices and was a prerequisite for profitable prebends and other benefices. It is quite possible that Copernicus met Tiedemann Giese and Mauritius Ferber (originally from Gdańsk and related to each other) during such practice. Both were Bernard Sculteti’s protégés owing their Frombork canonries to him, and later became the closest friends of Copernicus in Warmia. It is uncertain when exactly Copernicus left Rome. What is certain, however, is that on 6 November 1500 he observed an eclipse of the moon there. He probably arrived in Bologna soon afterwards. In the summer of 1501 he went to Warmia in order to personally ask the chapter to allow him to continue his studies.